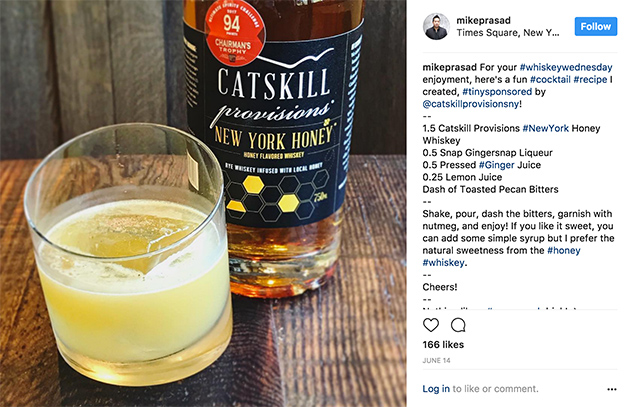 Your spirit in a custom cocktail recipe on Instagram! Have a cool product that I can use to make an amazing cocktail? Have a delicious recipe I can create? I'll create a cocktail recipe post on my Instagram, which is followed by top bartenders and enthusiasts. I'll also post to my twitter account. The Instagram post of the cocktail will feature a recipe created by me and any hashtags and the Instagram story can be a fun "Making of" or "How to Make" sequence or video. Check out the gallery for examples! See the example below or click here to view it! Tinysponsor Co-Founder, Investor at ventureLab, Strategist, Traveler, & Foodie. Previously, founding @ Kogi BBQ, Supermassive, Bit Love Media, Hawaii Bitters & more. Content may contain Alcohol, Strong Language.